Dental hygiene is important. Once you have washed your hands and put on gloves, you don't want to be fussing around with monitors. Discover 3 types of wall mounted monitor arms preferred by mainstream dentist. Dentists need to operate in very tight spaces, adjusting monitors while working on their patient's teeth. We, at Cotytech have created a number of useful, ergonomic wall mounted monitor arms to help you complete your task effectively. Here are three types of Cotytech wall mounted arms preferred by mainstream dentist. 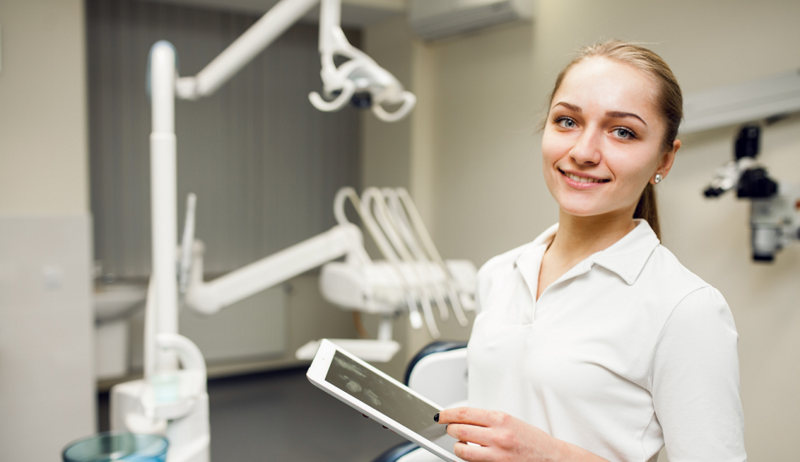 When you graduate from dental school, you might be ready to run your own profitable dental clinic. Naturally, your patients might want to watch television while waiting. You can use our Cotytech Corner TV Wall Mount to keep them entertained. This can handle 22- to 37-inch televisions. It includes a mounting holes adaptor kit for easy assembly. Our wall mount supports up to 60 pounds. Dentists may need to complete a number of important tasks in a very limited space. It can be a challenge to view the patient's teeth, while viewing the computer monitor. Most dentists will also have various tools in their hands; therefore, they might need to adjust computer monitor arms with one hand. The best computer monitor arm is durable, flexible and easily adjustable. As you move around the patient, it still remains accessible. That is why you might want to take a look at our Cotytech Long Reach Monitor Arm. No matter whether you are on the patient's right or left, you can view the monitor during procedures. Our aluminum alloy model features a built-in gas pneumatic spring design for ease-of-movement. It also includes a keyboard for fast patient data access. Our superior ergonomic design optimizes your comfort, while establishing easy viewing and ease-of-use for the monitor arms. Busy dental clinics might require several monitors for viewing. We understand and have provided the VESA Wall Mount for 4 x Monitors with Short Arm included. This can support up to 22 pounds for each monitor. It also has a 30-degree tilt for superior viewing. We are a forward-thinking manufacturer of a variety of home and business wall mounted monitor arms. We design state-of-the-art flat screen, LCD, and plasma TV monitor arms. Cotytech is your premier source for practical, affordable and ergonomic flat screen mounting and placement systems. So, take a look at our products and determine if one is ideal for you. Besides wall mounts, we also have stand-alone mobile, desk and ceiling mounted monitor arms. Find the most useful, ergonomic flexible computer, keyboard and monitor arms to deliver the best patient care.